The excessively named Star Wars: Episode VIII The Last Jedi 4-pk. 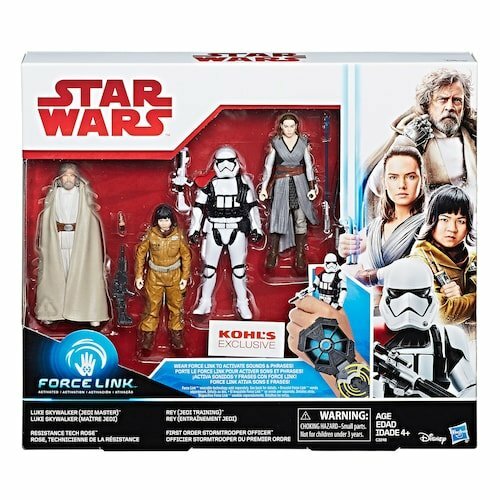 Luke Skywalker (Jedi Master), Rey (Jedi Training), First Order Stormtrooper Officer & Resistance Tech Rose Figure Set by Hasbro is in stock on Kohl's web site. The only actual exclusive in the set is the Stormtrooper, which may be a mix of parts already on the market - I haven't had the chance to examine it up close yet. Retail is $49.99, but a 20% off coupon gets it down to about $35.99. 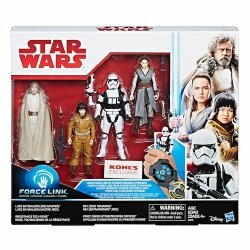 Kohl's is legendary for sporadic sales, coupons, and stackable offers - I would advise you to hold back until you can get it for under $30. Thanks for letting us know Kohl's had it up today, Daniel!